Whether you own a single boutique hotel or a hotel chain, you have to ensure that potential travelers know that your stylish and comfortable property exists. With 43 percent of travelers use smartphones to look for properties and 76 percent choose desktops for research, a digital presence is a must for hoteliers. To build and manage your distribution strategy, you have to connect the hotel property management system with other booking and data sources. While you can stick to the options available as part of your channel management software (if you use one), sometimes you have to customize channels to boost reservations using APIs or services provided by various distributors (e.g. OTAs). An API (application programming interface) defines the way software components interact with each other. Acting as an abstraction layer, it allows applications to exchange data. And the type of functionality and data streams depends on your goals. To learn more about APIs and how distribution works in the hotel industry check our video. Previously we talked about travel and booking APIs for online travel and tourism service providers. In this article, you’ll learn how to gain exposure on various distribution channels and which APIs and services to use for inventory management. People looking for a hotel prefer finding room prices in one place so they can compare them and decide which property is a perfect fit. That explains why more than 45 percent of travelers use metasearch sites for trip planning. Because metasearch engines allow for showcasing a property to a wide audience of customers, travel providers should consider a partnership with these sites. Unlike OTAs, metasearch sites don’t have their own inventory database. They aggregate data from multiple search engines and display the most relevant results in a single list. That also means metasearch engines don’t sell rooms. Thanks to cost-per-click (CPC), metasearch sites are perceived as a middle ground between OTAs and direct bookings. TripAdvisor, trivago, and Google Hotel Ads are among the most popular metasearch price-sourcing engines in the hospitality segment. So, how you can make your property appear in their listings? The popular travel review website provides a number of APIs for hotel owners. Hotel Availability Check API. This API is one of those available for small hotel and B&Bs owners who use the TripConnect advertising bidding tool aimed at driving direct bookings. The idea of this service is simple: Users may visit a property website after having seen it in the TripAdvisor listing. The API allows for showing hotel prices and availability on the review site. And with the latest API version, hoteliers can display room rates separately from fees and taxes including subtypes. Instant Booking API. More and more travelers plan and manage trips on the go. While the desktop bookings share is still large (61 percent), 33 percent of hotel reservations are made on smartphones. However, travel providers who have a booking app get up to 60 percent of transactions on mobile devices. So, property owners can benefit from this trend with Instant Booking API that allows customers to make reservations on the TripAdvisor mobile site or through its app. The TripAdvisor team manages the booking and then sends all the related information to a travel supplier. A traveler can look through available rooms, choose one using such criteria as room type, size, amenities, or maximum occupancy, submit the reservation, and verify whether it was successful. The API allows for the booking cancellation. Join our Techtalks to give your expert insight. How do people usually explore accommodation options? Google. There is a way to promote your property on the world’s most popular search engine. Google offers two integration options. The first option, Hotel Prices, entails sending hotel fares to Google that will show them in the organic hotel listings. You’ll need to team up with third-party integration partners authorized by Google. Another way is to launch the Hotel Ads campaign, which reaches customers “at the moment of research and decision.” The service displays a property on google.com and Google Maps to both desktop and mobile users. People can quickly check room availability as well as evaluate a hotel by description amenities and policies, reviews and rating. Hotel Ads works on a bidding basic: You set bids to make the link to your hotel’s booking page appear along with search results from OTAs. Account Assignments API allows for managing hotel listings in the specified account and/or its sub-accounts. Bids API gives a user the ability to submit real-time bids and get bid history. Budgets API lets a user view and change account budget settings. Feed Status API is built for reporting on such feeds as transactions, as well as errors and warnings that occurred during their processing. Groups API allows for making changes to hotel listings. Hotels API gives access to the Hotel List Feed that contains properties for which a user will give pricing information. Prices API provides a user itinerary and pricing data for a specific hotel. Reconciliation API allows Hotel Ads Commissions Program (GHACP) participants to receive reconciliation reports for a particular period of time; a user can also validate (make sure they have no errors), upload, or download these reports. Reports API provides analytics for accounts and sub-accounts. Scorecard API allows hoteliers to check on overall account performance. 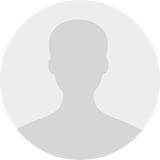 Sub Accounts API provides sub-account information, for instance, billing details. trivago FastConnect API. With this standard API, the metasearch site makes on-demand requests for hotel fares and availability. By using an inventory feed, trivago maps properties with items in its database. That allows the site to show fares and place deep links to hotel profile pages correctly. The line between metasearch sites and online travel agencies gets fuzzy. Metasearch engines that were initially developed for rate comparison now can be used for reservations. TripAdvisor and Google Hotel Ads demonstrate this shift. Every property owner wants to see guests coming through a hotel entrance 365 days a year leaving no beds vacant. Maximum online exposure is one of the factors that affect room occupancy. To successfully integrate a hotel CRS or PMS with various distribution channels (GDSs, metasearch engines, and OTAs), you have to set up a connection separately with each of these platforms. But, there is another option: Delegate this tedious work to connectivity and switch providers. Let’s see which vendors can effectively distribute your inventory. DHISCO is one of the leading distribution companies for the hospitality industry. The company connects more than 514,000 properties with over 100 distribution partners. The vendor has four products for hotels. DHISCO switch was developed to facilitate fast booking and messaging. It allows a property to manage and approve the reservation, and send a guest confirmation. The solution supports XML messaging. DHISCO shop provides customers with data on room rates and availability, including such information as child-specific rates or property policy details. DHISCO cache enables faster booking. The solution reduces response time from the CRS by moving popular transactions to the cache. DHISCO content distributes image and text data, including actual room information to travel-selling partners in a form that’s easy to grasp. For example, the tool transforms terms or abbreviations. DHISCO content also provides translation services. DerbySoft is a distribution service provider whose solutions fit both property owners and travel sellers. Businesses can choose from three core products. Build is a platform designed to connect large hotel groups with distributors. DerbySoft positions its solution as the alternative to a costly direct connection, which takes a lot of time and integration effort. Click is a set of metasearch marketing services for those hoteliers who strive to get more direct bookings and reduce their dependence on OTAs. Go will be useful for hotel chains as it connects them with smaller OTAs, tour operators, and wholesalers. DHISCO and DerbySoft don’t provide open source API documentation unless you contact them directly. More than 30,000 hotels from over 160 countries distribute and control their inventory with the cloud platform by SiteMinder. The platform consists of several modules, each with a specific functionality. The channel manager allows travel suppliers to showcase and sell properties on 350 booking channels, including OTAs, wholesalers, and GDSs. Online booking engine TheBookingButton supplements distribution-related services, allowing hoteliers to offer direct reservations. Wholesalers (AKA bed banks) are third-party organizations that sell hotel rooms they bought in bulk for a negotiated price. OTAs and travel agents are wholesalers’ main clients. Partnership with these organizations has its pros and cons. On the one hand, you can sell more on a large number of markets and predict room occupancy. On the other hand, you can’t implement dynamic pricing for a fair amount of time and you will make less due to low net rates or high commissions wholesalers demand. Our advice is to clarify room re-selling policies before signing the agreements. HotelsPro is a global B2B company that provides hotels with access to more than 34,000 retail customers and over 800 OTAs in 205 countries. It will cost you zero dollars to add an inventory to a HotelsPro database and start selling rooms to more than 160 source markets. You need to fill in and submit a form on the website and agree to such requirements as a flexible cancellation policy and rate advantage or parity. The wholesaler shows its APIs only to partners. Hotelbeds can also impress you with a partnership network, daily bookings, or a number of available source markets. The wholesaler emphasizes the simplicity with which it distributes properties to more than 200 source markets. Hotelbeds partners sell and manage their inventory and gain control over reservations via MaxiRoom extranet – secure corporate network. HotelConnect is a set of technology solutions to ensure simple and fast integration of your CRS or PMS with Hotelbeds’ distribution system. These solutions include direct XML link, Smart Scan cache solution, channel manager, and push/pull integration. To join the marketplace and choose an optimal integration solution, send a filled in contact form to Hotelbeds product managers. JacTravel is another large hotel accommodation wholesaler that gives exposure to more than 20,000 travel providers from 92 countries. The bed bank partners are able to control rate and availability using its extranet and channel managers. Besides inventory management, the wholesaler allows for developing email campaigns in 14 languages and an online payment processing solution. Property owners must contact JacTravel to discuss business needs and available technical solutions. A global distribution system (GDS) is a network that collects data from multiple travel suppliers enabling travel agents to book accommodations, flights, vehicles, and other services. So, hotels connected to a GDS get worldwide exposure by making their inventory available to travel agents and their clients around the clock. Sabre, Amadeus, and Travelport are the main global distribution systems. The GDS, whose global market was 36.4 percent by the end of 2017, offers suppliers to make their inventory accessible to more than 425,000 travel agents across the globe. You can join the marketplace and load your content with Sabre Commerce. Sabre Commerce is a set of solutions and marketing programs that allow travel providers “to hit all points of sale.” Property owners are offered the use of HotelCommerce products for their distribution strategy development. Direct Connect is a connectivity solution that allows travel agent specialists to receive up-to-date information on hotel availability and rates in the XML format. At the same time, hoteliers are current with the reservations that were made because property data is generated directly from the central reservation system. Hotel Rate Assured is a hotel certification program used to build a trusted relationship with travel agents. It certifies that hotel rates available on Sabre are similar to those found on travel sites. Hotel Total Pricing allows for showing room prices with fees and taxes. Custom Offers is a feature that displays customized offers (i.e. a free breakfast and a late checkout) to draw travel agents’ attention. With Sabre Media Solutions, such as the Hotel Spotlight program, suppliers can buy a preferred placement for their properties in the listing. The GDS with the biggest market share (42.4 percent) has several distribution solutions for hoteliers. Amadeus connects properties with various points of sale, including travel and retail agencies, travel management companies, corporations, and web services customers. The global distribution system provides two connectivity options. Hotels with CRSs can be integrated directly (via an API) or via switch providers. Properties that don’t have CRSs or can’t support a connection between a GDS and CRS can be integrated through its hotel representation company LinkHotel. The system also provides tools for advertising and performance monitoring. However, you need to contact Amadeus representatives to learn about its solutions in detail. Travelport consolidates three global distribution systems – Apollo, Galileo, and Worldspan. More than 650,000 hotel properties choose Travelport to promote their brands to travel agencies and corporate travelers via the Travel Commerce Platform. The platform is designed for both hotel chains and independent hotels. One of the good things about it is that properties pay a commission only if a reservation is made. In addition, participating hotels can launch advertising campaigns and use real-time business intelligence. Travel providers integrate with Travelport in three ways. The first option entails flexible connectivity through an API, traditional technical standards, or a mix of both. With hybrid connectivity, property owners can transfer some data through an API and use industry standards for another part. The third connectivity option allows for using existing industry-standard infrastructure only. Like Sabre and Amadeus, Travelport provides additional information about connectivity solutions on request. An online travel agency (OTA) is a website that sells products from multiple travel suppliers. An OTA is a single marketplace for travelers to search and book accommodations, railway and airline tickets, rental cars, transfers, cruise lines, as well as holiday and sightseeing packages. Booking Holdings and Expedia are the main OTA players, each of them owning numerous brands. The OTA has Connectivity APIs that provide numerous functions. Content API. This API directly connects hotel content providers to Booking.com, allowing them almost instantly to build, maintain, and update listings for multiple hotels at the same time. Before the launch, providers have to upload such content as photos, property description, facility information, rates, and policies separately for each property. So, the key benefit of the Content API is automation. Content providers that are already working with the online travel agency can get specifications free of charge once they log into their accounts on connect.booking.com. New providers must be certified by Booking.com to gain free access to Content API specifications. Property owners can only connect to the OTA through a channel manager. Rates & Availability API. This API’s functionality speaks for itself. A user can specify a property’s inventory they are willing to sell on Booking.com (the number of suites and their types), set their availability, fares, and availability restrictions. Reservations API. The API allows hotel staff to retrieve, change, and cancel bookings made by the OTA customers. Promotions API. Travel providers can create, activate, and modify promotions for a property, and retrieve information regarding existing offers. The API allows hoteliers to introduce Basic, Early Booker, and Last Minute Deals. Reporting API. Properties can notify customers about changes made to their reservations. Changes can relate to a check-in time, price, and the reservation status in general. For example, a property can report to the OTA that an invalid credit card was used for a reservation. Booking.com will send an email or SMS to a customer suggesting they use another card. Another way to reach a global audience is to partner with Expedia Group – one of the leading online travel companies. Listing a property with the company whose travel booking sites get more than 600 million visits every month seems more than reasonable. Like other travel brands, Expedia registers partners for free. You’ll need to sign an online contract, provide your payment and billing information, high-quality photos of your hotel, and add rates and availability. The company team will do the rest of the work. You’ll be able to manage your property’s data with Expedia Connectivity APIs. APIs are combined into two groups according to the functionality they provide. Expedia QuickConnect Avail & Rates API allows hoteliers to automatically send updates on availability and rates. The Booking Notification API lets partners receive real-time notifications for reservations made on Expedia sites. Booking Retrieval and Booking Confirmation APIs allow users to electronically retrieve all the reservations that were made, changed, or canceled, as well as provide customers with a confirmation number. Product API gives owners the ability to add and modify data on hotel inventory (rate plans and suite types) instead of using the Expedia Group Partner Central app or contacting their market manager. Travel providers can also learn how to manage room types and fare plans correctly. Property API allows for uploading and updating hotel-related content, such as images, descriptions, policies, and fees. Product, Availability and Rates API returns information on rooms and their rates. Image API enables users to upload images in bulk, read existing images, and edit their metadata. Deposit API lets hoteliers define, change, or remove a deposit policy for their properties. Technology providers and travel companies offer various options and solutions, so you can build and customize the online distribution strategy that meets your needs and budget. When looking for new distribution channels, it’s crucial to consider such aspects as property type and size, location, a channel’s monthly number of active users, operational requirements and restrictions, as well as commission. For example, bed and breakfast and independent hotel owners can choose metasearch websites to increase their brand awareness and partner with OTAs with relatively low commissions (hotels.com, BedandBreakfast.com, or Lonely Planet). Large hotel chains that have many rooms and strive to fill all of them can choose higher commission OTAs (Priceline, Expedia.) At the same time, well-known hotel chains can compete with OTAs for direct bookings by promoting themselves on metasearch platforms. 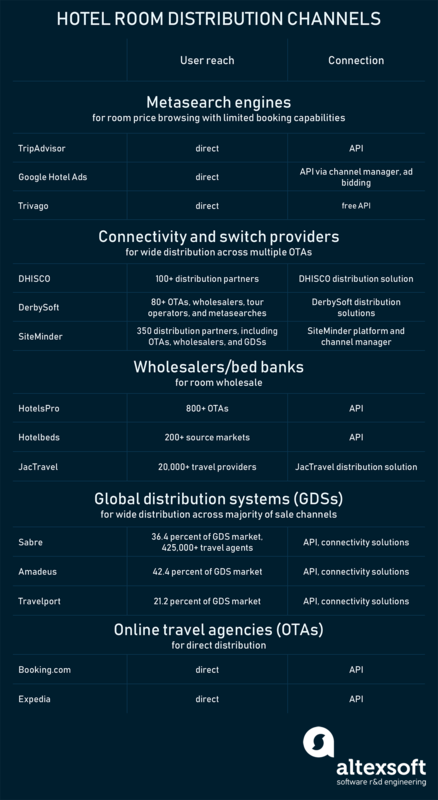 Feel free to look at our infographic about hotel distribution. We hope it will help you choose the right path to your customers.